Troubleshoot your NORAC system with your computer, smartphone or tablet with NORAC Solutions – a web application designed for troubleshooting NORAC products. For user convenience, Solutions™ was designed to be used without an internet connection – simply load the site once on your preferred device. Warranty covers defects in materials and workmanship in all of NORAC’s products. Items include control systems and genuine replacement parts manufactured by NORAC. Auxiliary components not manufactured by NORAC or NORAC rebuilt parts are covered by a 90-day warranty. Congratulations on the purchase of your Boom Height Control system. NORAC continues to develop Boom Height Control systems that provide the best performance available on the market today. Warranty is only available if you register your new purchase or if you purchase Extended Warranty. By registering within 30 days of purchase, most system updates will be done FREE OF CHARGE for the next two years. 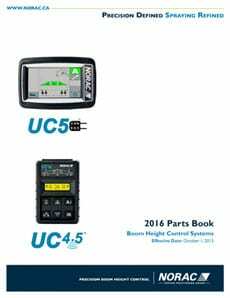 I wish to purchase a 'Parts-Only Non-Transferable One-Year Extension' to the warranty for my UC4.5™, UC5™, or UC7TM system for the price of $699.00. I wish to purchase a 'Parts-Only Non-Transferable Two-Year Extension' to the warranty for my UC4.5™, UC5™, or UC7TM system for the price of $999.00. I do NOT wish to purchase extended warranty, but will register my product in order to receive the standard one year warranty and two years of free software updates.